Multi-national R&B/Funk/Latin group, based in Los Angeles, California. Evolved from a group of musicians previously known as “The Creators”, the “Romeos”, “Señor Soul” and “Nightshift”, and who played the L.A. club circuit. They were discovered and promoted by Jerry Goldstein who linked up the musicians with frontman and vocalist Eric Burdon and harmonica player Lee Oskar. 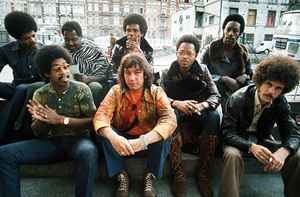 In 1970 they released their first album, “Eric Burdon Declares War”. After Burdon departed in 1971, the group continued performing and recording as War.